My husband Kevin is Snow Miser; I am Heat Miser. Kevin (who is the creator of FunTitled Workshop) sewed our costumes (tops, sparkly leggings, my collar, his scarf, and both our shoes). He created his ice hair but carving several layers of insulation and forming a helment, then covering it in Modpodge and using the spray gun to accent the shapes. I did the makeup for both. Please tell me where you got everything omg both of these are beyond epic! (best ones I have seen and i've been looking for costumes forever! Can I just buy these from you OMG! Also any make-up tips are appreciated!! I left my email below feel free to send me any tips! Thank you. We made them ourselves and did our own makeup. We are having a costume Christmas party (2nd year in a row) and guest must come dressed as anything related to Christmas. 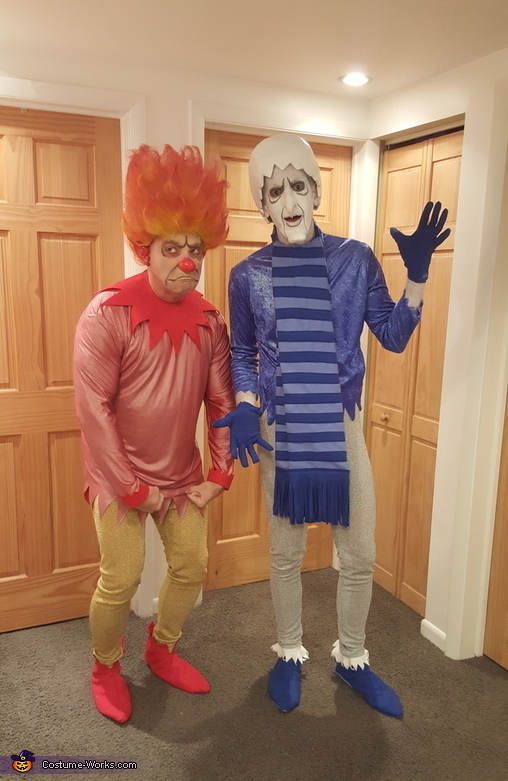 We decided on Heat &Snow Miser! I'm going to use yours as initiation. I don't sew so I'm going to have to hit thrift shops. Any helpful tips you can share would be awesome!